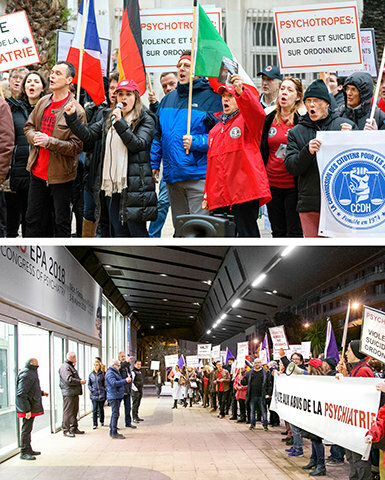 More than 150 protesters stand on the doorstep of the Nice Acropolis Convention Center, making their voices heard by psychiatrists attending the European Psychiatric Association’s annual convention. Nice might be a scenic beachside city on the French Riviera, but when the European Psychiatric Association (EPA) decided to hold their annual shindig there and CCHR France decided to have something to say about it, things were anything but peaceful. They then opened the Psychiatry: An Industry of Death traveling exhibit. Over the ensuing days, exhibit visitors included EPA psychiatrists, educators, nurses, journalists, psychologists, medical doctors, parents and students. A lawyer, after touring the exhibit, shared his observations that most patients are not properly defended in court and become illegally committed. A young Dutch psychiatrist stated that she had no intention of working in a psychiatric institution due to abuses. She wants to help her patients, not drug them. I find this exhibit so enlightening. I wonder why I wasn’t taught some of this when I went to school. It would have changed my mind about the profession I was choosing. I’m happy to see this exhibit exists. My parents put me on ADD medication when I was young, and I felt really betrayed, but never said anything. This makes me feel better about what I knew was wrong at the time. I thought psychiatry was pure work. Now I see that it is cruelty. I am very impressed by the work of CCHR. I now understand how parents and children are suffering because of the labeling of “developmental disorders.” Medicating children is not the answer. Now I can understand the reason why my husband died. Before he died, I believed that psychiatrists could help my husband. It was totally an illusion. This exhibit shows the answer to my questions about psychiatry. This exhibit is brilliant. I was in the psych system and what I experienced was abusive treatment. I was incarcerated in a hospital and a nurse would push tablets down my throat with her fingers. One nurse advised me that the only way for me to get out was to play the game, say I was feeling better and had new insights into my mental condition. I want to help CCHR.